I have not been to the Post Office in the last 12 years. But last week, I went with mom and dad . They had invested a little money a while ago, in some postal savings scheme, and my signature was needed in order to redeem it. My first impression of the interior. At first I thought nothing had changed at the Post Office - but then I realised the red colour was new. The place was brighter than I remembered. And there were now chairs that you could sit on, while you waited for the files to move. That's Dad, seated, waiting for his cheque. Mom in the rust colour saree. She's helping the lady in green fill a form in English. A Tamil-speaking lady in green was having trouble with forms. Mom as usual, volunteered to help. I wandered off with the camera, clicking photos. The first thing I noticed was this couple. 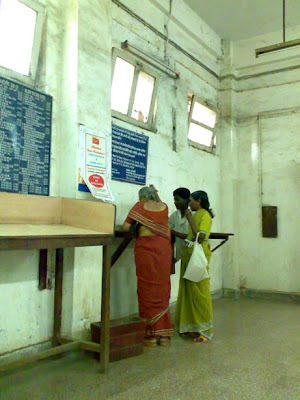 They were at the Monthly Income Scheme counter. This is a scheme where you deposit a certain amount, and then you withdraw on a monthly basis. 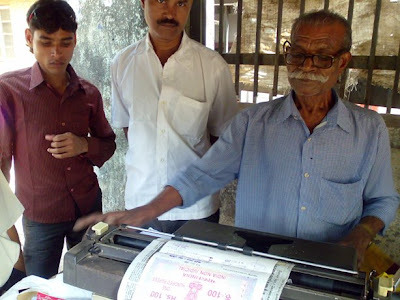 It is popular with retired people - perhaps there was a family elder on whose behalf they were withdrawing. I sneaked a peek at the man behind another counter. I wondered what his job was. I found out easily enough. His job was to write things in big fat ledgers. It seemed to me like the dullest job in the world, scribbling little numbers on page after page, book after book. And yet, this is a sought-after job, bringing with it a certain social standing. A man with a steady "go-ment job" has no trouble finding a bride. 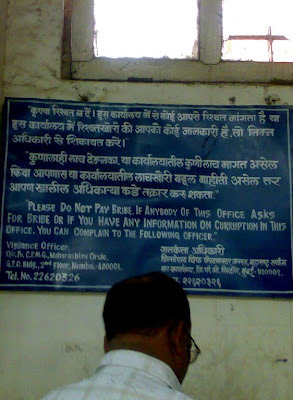 I saw the usual board, asking people not to bribe officials. A little further away was the mail dropbox. If memory serves me right, the red slot below is where I used to drop letters to my German pen-pal. I wonder if anyone has-penpals these days! The green is for inside the country, and the red is for international. I wandered outside the post office gate, and found a little blue office. The board on the office said, "Harris Michael Koli, Investment Consultant. Please phone on mobile before comming" (His spelling, not mine!). Exterior of Sion Post Office. On the building you can see the new logo of the Indian Post Office, launched in 2008. It is meant to represent a new dynamic and modern postal system, in tune with the twenty first century. Frankly, in a country this size, that is not an easy achievement. I looked up the India Post website and found that we have a staggering 155,035 post offices in the country, of which 90% are in rural areas. 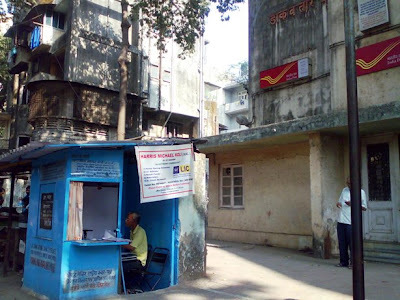 The average distance you have to walk anywhere in India, to find the nearest Post Office is 2.59 kms. 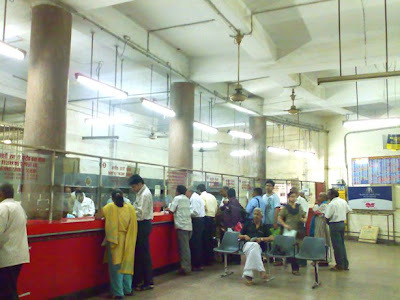 Of the 155,035 post offices, 2,500 have completed what the India Post calls "Modernisation (Improving Ergonomics)". I wonder what they did as part of this exercise! 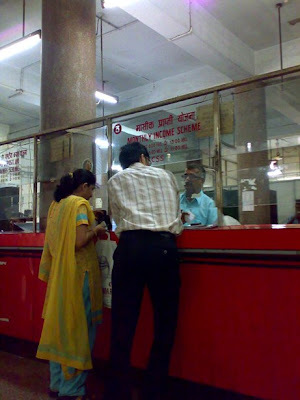 There are 30,000 female employees of India Post. This is 10% of the total staff. Another interesting thing about the Indian Post is that it provides employment for more than just it's staff. Like Michael Harris Koli above, or this gentleman with the moustache below. Mr. Moustache - the grand old man outside Post Office! 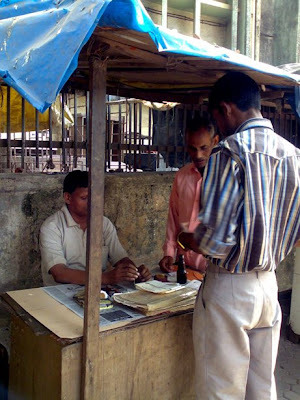 Mr. Moustache has been a fixture outside the Sion Post Office for the last 20 years. What does he do? 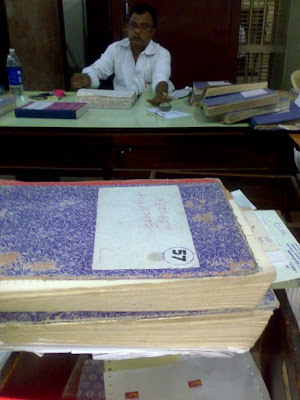 He is a typist, and he types out legal agreements on stamped paper. It has nothing to do with India Post, this is just a very good place to set up shop. Next to Mr. Moustache is another counter - this is a Registered Parcel service. You tell the man the address, and give him your parcel. He wraps it in the right sized envelope or packet, seals the package with wax, and fills in the post office Registered Parcel form. All you have to do is take it inside the Post Office and send it off. It's a handy service if you can't read or write, or don't have the right packing material at home. When I wandered back inside, I found that our cheque was ready. Dad was pleased as punch. We didn't have to wait too long, or fill lengthy forms. The records were computerised, it was easy to check the file and see what was due. It was all very pleasant. 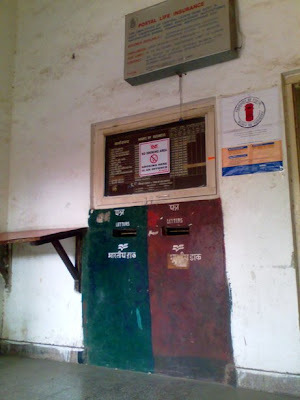 And while it isn't as fast or easy as say, a private sector bank, I suppose things *have* changed, after all, at the Post Office. 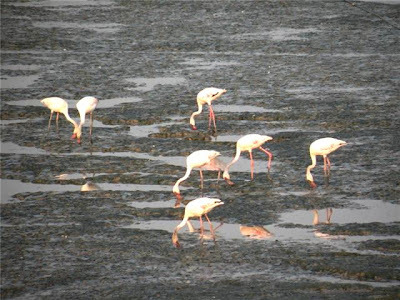 My uncle, A. Krishnan, sent in these photos from his visit to the Sewri mudflats last week. Our pink visitors are here again! Flamingos are very interesting birds. You know they're not born pink, right? Baby flamingos are a whitish-grey. They turn pink over time because of algae in the food they eat. So this kiddo on the right has some years to go (and lots of eating to do!) before he looks as pretty as that other guy on the left. They have a funny way of feeding - they eat by holding their bills upside down in the water. See that deep curve on the bill? There's a specially adapted tongue inside the bill that filters tiny food items. 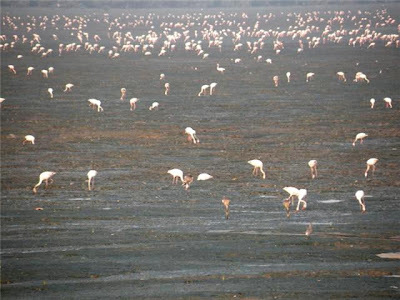 In lesser flamingoes, the bill pumps water 20 times a second, while the tongue filters away like crazy!! They need about 60 grams of food a day, so no wonder they feed all the time. Just in case you were wondering, the flamingo tongue tucked away inside that bill is large, fleshy and has little bristly projections. Yeew? The early Romans thought it quite a delicacy, anyway, and pickled flamingo tongue was on the menu at their parties! I kid you not. Here are some more birds that have not yet turned fully pink. You can really see the curve of the bill beautifully in this photo. Babies are born without the curved bill, by the way. Strange huh? It takes some weeks for the bills to start curving. Until then, parents feed the chick. Both dad and mom produce a sort of "milk" - well, let's call it milk, even though it is red in colour. Babies store the pigment in their liver, which then gets deposited in their adult feathers as they grow. You know another interesting thing about flamingo babies? They grow up in creches. Flamingos lay a single egg, on mounds of mud. When the eggs hatch, the chicks join a creche, a sort of group child-care facility which is marshalled by some adults. The adults lead them on foot to fresh water sources, because the chicks can't fly. Mom and Dad come to the creche, find their kid, and do the milk feeding thing. Hah! If only we had that sort of child-care to help Mumbai's stressed out working parents! Here's a longer range view. These are mature adults, since they're all pink. Flamingos live for 40-50 years, did you know? I found that very surprising, because I always thought birds were short-lived. Goes to show how much I *really* know about birds! Here's a still longer range photo. Look at the number of birds in the distance! How pretty they must look when they're flying! 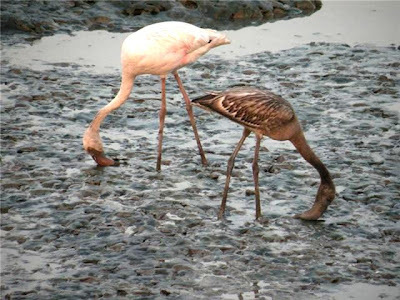 There are lots of flamingos at Sewri right now, but there are also many waders and kites and other interesting birds. 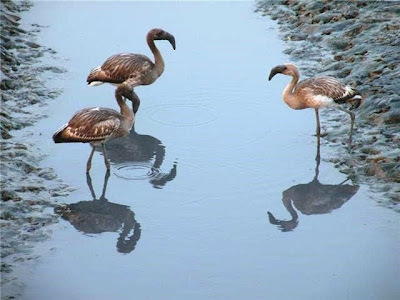 The best time to see birds is between high tide and low tide, so look up the newspaper and see when the high tide is. If you go 3-4 hours before that, you should have a pretty good shot at spotting them. Or else, you can go just after high tide. If you take the train to Sewri, then the big main road that comes out to the east of the station goes to the Sewri jetty. You can drive there as well, via P D'Mello Road, or the inner docks road. Ashbirder has a pretty good map, if you want one. So what are you waiting for? Grab a pair of binoculars and head out! It's right in the middle of the city, you don't even have to go outside the urban jungle! !